Heidelberg provides the complete range of high quality consumables for your Linoprint Digital System, including toner, glues, and staple cartridges and hole punching supplies of all types. A starter kit of consumables is provided with the purchase of your new Heidelberg digital equipment. Our digital supplies can be ordered online at the Heidelberg eShop or per telephone at your regional Heidelberg Help Desks. 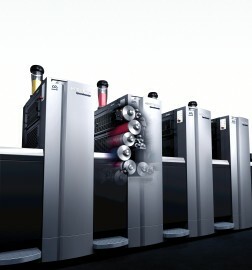 To help you save on consumables costs, we also offer advantageous service agreements tailor-made to your needs: please contact your local Heidelberg representative for more information on terms and conditions. The essential challenge in digital printing is reliably and consistently obtaining the best print quality. Reproducible and comparable results are a must, especially if you want to use both print processes equally. The products from our Saphira Digital product line have been specially developed for the Fire product portfolio digital printing systems and put through their paces in sophisticated tasks. They are high quality and supremely cost-effective. Their versatility in terms of applications will make you stand out from the crowd. You can produce a wide range of jobs profitably and still guarantee to satisfy your customer's demands with impressive performance. Ecology begins with the purchase of the machine, which is why we offer all machines CO2 neutral.